Vintage - Franciscan China, Mid-Century Modern - Made in California in the "Woodside" FNWOO Pattern - Manufactured from 1941 through 1965 - Although a Tea Set totaling (27) Pieces, it also includes (6) Dinner Plates. 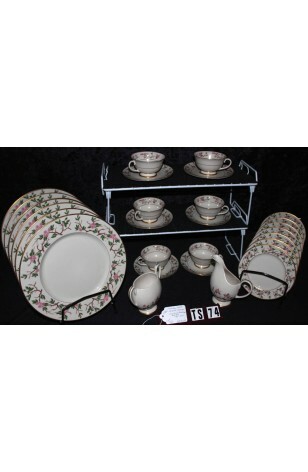 An Ivory Background Tea Set, with a Wide Lip on Plates, which hold a Pattern of Pink Flowers, Green Leaves, and Brown Branches called "Woodside". All of these Pieces have 22kt Gold Verges, 22kt Gold Rims, 22kt Gold Feet and Handles. The Colors are Bright and Features are very nicely Defined. Shapes of the Sugar Bowl and Creamer are Mid-Century Modern. 7 - Bread/Dessert/Tea Plates - 6 3/8"